Having a special place where you feel comfortable and relaxed can help when you are upset. Even if you can’t actually visit it, just going there in your imagination can help you clear your head and calm yourself. Imagine you are travel agent setting up a website that offers “Employment Getaway” vacation packages. Write the description of your favourite spot for calming down. 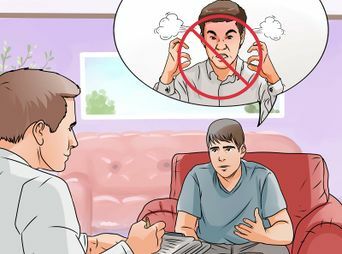 Holding anger inside is harmful for you but you can find ways to release your feelings symbolically. Imaginary and symbolism can help people cope with things that bother them in life. Write a letter to someone you are angry at. Tell that person what you really think and then tear up the letter. Imagine that a pillow is a person you are mad at and hit the pillow. Skip pebbles across a pond, letting an angry thought go with each one. Shoot baskets or kick a soccer ball toward a goal, imagining an angry situation with each shot. Write down your angry thoughts on a sheet of paper and then paint over them. This activity will help you symbolically release angry feelings you have been holding in. You will need a balloon, small strips of paper, and something to write with. On each strip of paper, write down something that mad you really angry and that you have not let go of. Next, roll each strip tightly and place it inside the balloon. Then blow air into the balloon, and as you do, focus on all the things you wrote down. After you have blown the balloon full of anger, hold the top of it closed. Take some deep breaths, say good bye to everything the balloon is holding inside, and let it go. Watch as your worries sail across the room and are forever released. How do you feel physically after releasing your anger? Are there other feelings that you would like to release (for example, sadness over a breakup with a girlfriend or boyfriend, stress over a family problem, or fear of failure in school)? Have you ever tried any of the symbolic releases mentioned earlier in this activity? If so what did you do, and how did you feel after doing it?